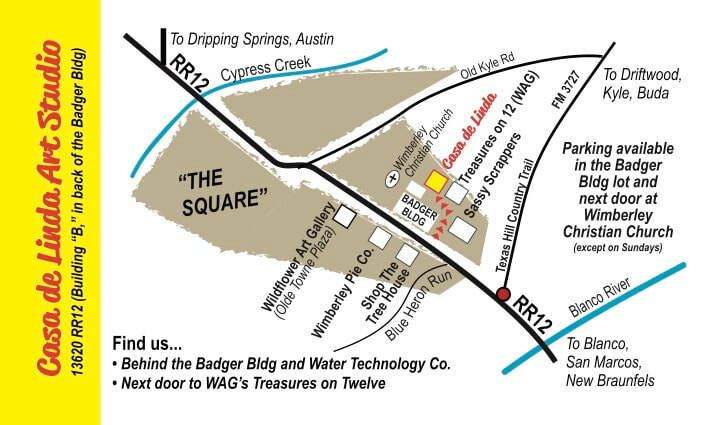 Are you an artist/art instructor interested in offering art classes or workshops in Wimberley? Do you have the passion, desire and know-how to teach children's art? We are looking for a few good souls to join our team! Send your resume and letter of introduction to linda@casadelinda.com. Linda has been teaching art on and off for all of her adult life. In early 2017 and after nearly 13 years teaching from her studio in New Braunfels, she relocated to Wimberley where she now offers a wide range of art classes year around for adults and children as well as a Summer Art Camp program. A native of Floresville, Texas, and a professional artist, Linda has a BA degree with a double major in art and communication arts from the University of the Incarnate Word, San Antonio, and a MA with a major in communications and a minor in art from Stephen F. Austin State University in Nacogdoches. She and her husband David also own Wildflower Art Gallery, also located in Wimberley. An award-winning artist and respected instructor, Lynette has taught all levels of students from basic through advanced. She is well versed in several different art mediums, including glass fusing/jewelry making, which she will be teaching this Summer in the Casa de Linda Art Studio Summer Art Camp program. Lynette also teaches adult classes in pastels and mixed media at the New Braunfels Art League. Barbara Worley is a leather artist and craftsman with an Associate in Applied Science –Saddle Making. A recent transplant from Idaho to the Texas Hill Country, she is continuing her love of crafting items out of heavy textiles and leather. Barbara works from her home studio where she creates custom accessories for home and body, leather goods, machine embroi- dery, jewelry, and more. She is pleased to return to Casa de Linda this summer introduce the art of leather craft to a new generation. LIZ ADKISSON We are pleased to welcome a new instructor to this summer’s Art Camp program. While this will be the first time that Liz Adkisson has taught through Casa de Linda Art Studio, she is certainly not new to teaching, to the area, or to her medium. A resident of Wimberley with a passion for clay, Liz has experience teaching children, whether working with Girl Scout groups, leading Sunday school classes, or having any of her 16 grandchildren drop by her studio to get in some creative time. Liz is a member of the Wimberley Valley Art League.